It gives me great pleasure to greet you all on International Nurses’ Day. 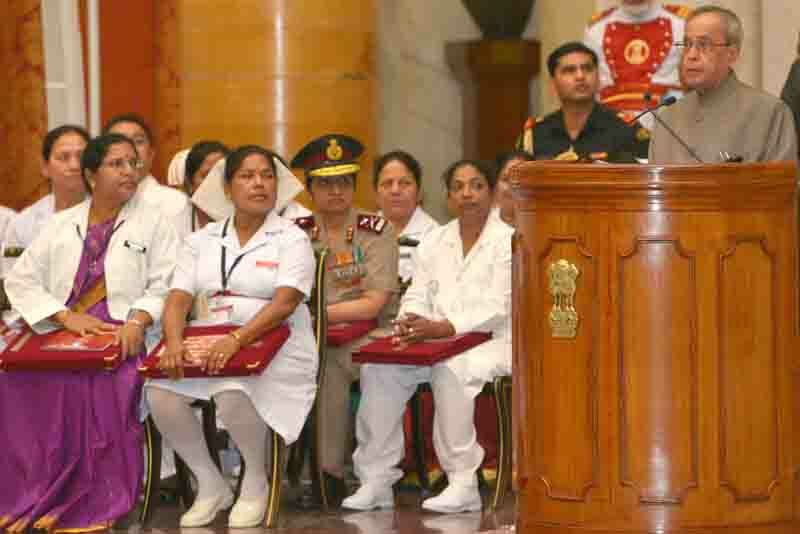 1.I would like to offer my felicitations to the men and women of the nursing fraternity in India. You are serving, with professionalism and courage, your fellow citizens in all regions of our country. It is your efforts that are vital in bringing healthcare and health services to our diverse regions. Your commitment and patience is at the forefront of polio eradication, mid-wife services and even educating communities as you work for their optimal health and improved quality of life. 2.On this day, we celebrate your contribution by recognizing the 35 outstanding men and women among you who have distinguished themselves by their extraordinary services in the field of nursing. The conferment of the National Florence Nightingale Awards for 2015 under the different categories, is therefore, a fitting tribute to the iconic ‘Lady with the Lamp’. Her foundational efforts were the inspiration and basis for the development of professional nursing and modern healthcare. 4.This is particularly apt on two levels: at the global level, 2015 is a milestone year for the finalization of the post-2015 agenda of the Millennium Development Goals. In this context, the input and partnership of nurses, the world over, is essential for the success of Governments and non-Governmental organisations in achieving their objectives of effective care and cost efficient solutions in the field of health. 5.At the national level, the nursing workforce in India is a valuable instrument of change. It is well known that nurses are the largest workforce in the healthcare industry in India. If they are properly trained and strategically positioned, they can help develop quality health care, strengthen healthcare systems and work effectively in interdisciplinary teams. They have an important contribution to make in planning and decision-making for the development of an appropriate and effective health policy for India, improving efficiency in public health programmes and reducing cost and wastage. 6.Nursing services and training facilities in India have expanded significantly since our independence. Today, I understand, the strength of the nursing sector in our country is about 26 lakhs. 90% of them are in hospitals and public health programmes. As first line health-care providers, they are active in all parts of India. At the village level, they are effectively delivering healthcare at the very door step of our people – urban as well as remote rural communities. 7.I am happy that Government of India has taken several initiatives for the further development of pre-service and in-service training and education for the development, upgradation and strengthening of nursing services in India. 8.These are important measures: we must keep in mind that the ratio of nurses in India, at the current level of 1.25 nurses per 1000 persons – is well below the world average of three per thousand. In some developed countries the ratio is actually much higher, varying from 9-12 nurses per 1000 persons. It is heartening to note that the total number of nursing institutions - providing training in Auxiliary Nursing and Midwifery, General Nursing and Midwifery and B Sc programmes in Nursing - has increased from about 1700 in 2005 to more than 6500 in 2014. During the same period, the total number of nursing personnel in these two categories registered with the Indian Nursing Council increased from 13.89 lakhs to 25.52 lakhs. To provide subsidized education in this area, Government has started schools for training in Auxiliary as well as General Nursing and Midwifery in 269 locations across the country. We need to continue to maintain this momentum to ensure that the requirement of nursing personnel in our country is adequately catered for. 9.There is also a need for greater focus on education and training of the nursing personnel. Under the 12th Five Year Plan, a budget of Rs. 2,150 crores has been allocated to the programmes and schemes for the improvement of nursing services in India. For the improved implementation of these initiatives, new technologies are being made available and applied for monitoring their progress. I am confident that the new measures that have been taken will go a long way in achieving the desired results. 10.I do believe that India’s nursing fraternity – both in the Government as well as the private sector, have earned tremendous admiration and respect wherever they have served -and continue to serve – because of their uncommon devotion and dedication to their calling. As a key constituent of the workforce of our country, they are an invaluable asset. While serving in challenging conditions abroad, they have brought credit to our nation and contributed significantly through their remittances. Through their disciplined attitude and high level of proficiency, they have earned tremendous goodwill in all parts of the world. 11.As we recognize and honor, on this day, the noble contribution of the nursing community of India, I wish them every success. May they grow from strength to strength as they serve their country and people. The nation is grateful for their gift of service and compassion. 12.I once again congratulate the H’ble Health Minister and the Ministry of Health and Family Welfare for their efforts towards the growth and advancement of the nursing community in India.